by date/time, media network and more. Competition has never been more fierce with brands spending more and more on advertising campaigns. Whether you're looking to secure a bigger media spend budget, understand shifts in market trends or planning out your competitive strategy - get access to the data you need. It all starts here, get a high level overview before jumping into the detail. Get a read on the media value across key media types. Gain actionable insights into how brands are distributing their budgets to inform the strategic media planning process. Our reporting is designed to be flexible because no two businesses are exactly alike. Get an understanding of the competitive landscape at a glance. Understand how much impact brands are making in market and if your advertising investment is enough. Sponsorships and partnerships are key in executing successful campaign strategies. 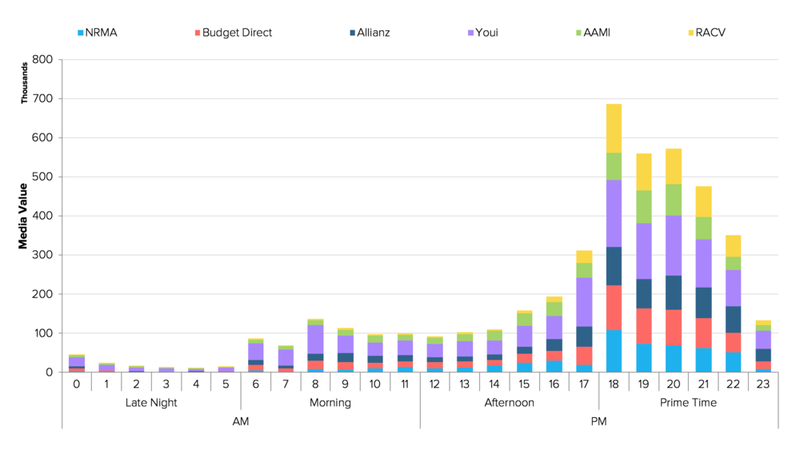 Identify where brands are aligning their budgets by network. Don't make the mistake of evenly spreading your advertising across a week. Gauge the investment from competitors, pick your days wisely and drive higher conversions. Go even deeper, line up your offline and online advertising by time of day to increase conversions. Avoid getting your advertising message washed out by competitors. Get a snapshot in time, see how you stack up in the bigger pie. Maybe it's time to take a larger slice? Location, location, location. It's not just the property market, the same rings true in advertising. Maximise advertising effectiveness by maintaining the correct distributions.